So this was the final version of the clock when I decided I was happy with it. You can check it out here. The one thing I still want to add it for it to auto-size the text to as big as possible for your browser window without overflowing. Someday I’ll figure it out I suppose. I was up until 2 a.m. because when it was almost done, the first time, I decided that I wasn’t tracking the states as well as I should, so I basically started all over. 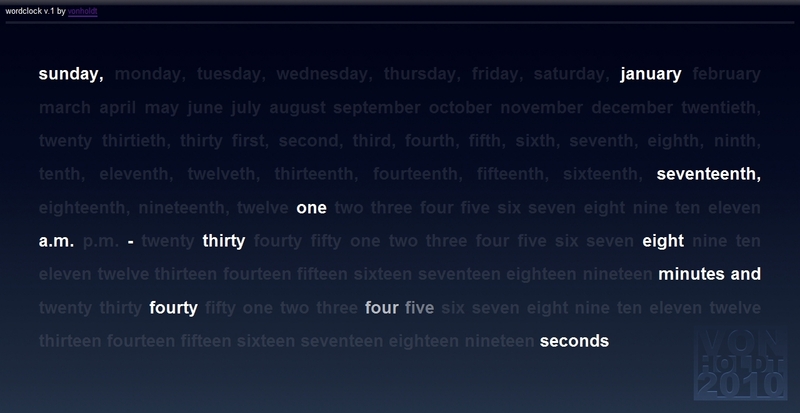 I saw some really cool “word clocks” on the internet like this physical one on instructables and this screensaver. I thought I would see what I could do with jQuery, so this was some preliminary work I did with minutes and seconds just to figure things out. The obnoxious colors are just so I can see which state the words are in.